Green Momster: Good News for Grevy’s! In previous posts, greenmomster has written about the beautiful and endangered Grevy’s zebra. 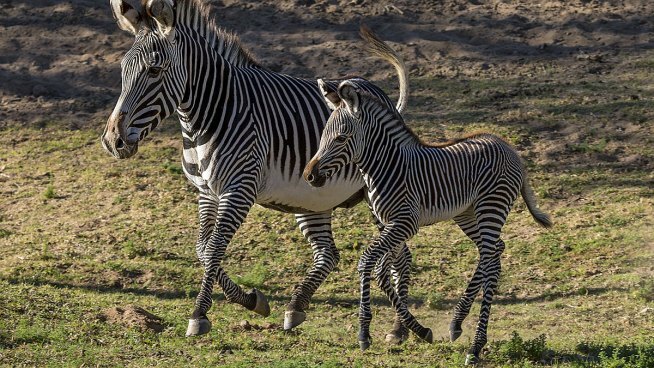 Well, now there’s great news out of the San Diego Safari Park – a new foal was born on January 5 (photo credit: Ken Bohn, Jan. 14, 2014 at the San Diego Zoo Safari Park), adding to the 140 Grevy’s zebras born in this very successful breeding program. With only about 2,250 Grevy’s in the wild, every birth is good news. Remember, you can help by adopting a Grevy’s zebra at the Cincinnati zoo or support the Grevy’s Zebra Trust, which works to employ members of the local community in zebra monitoring programs. Be sure to “Like” greenmomster on Facebook for all the latest endangered species updates!